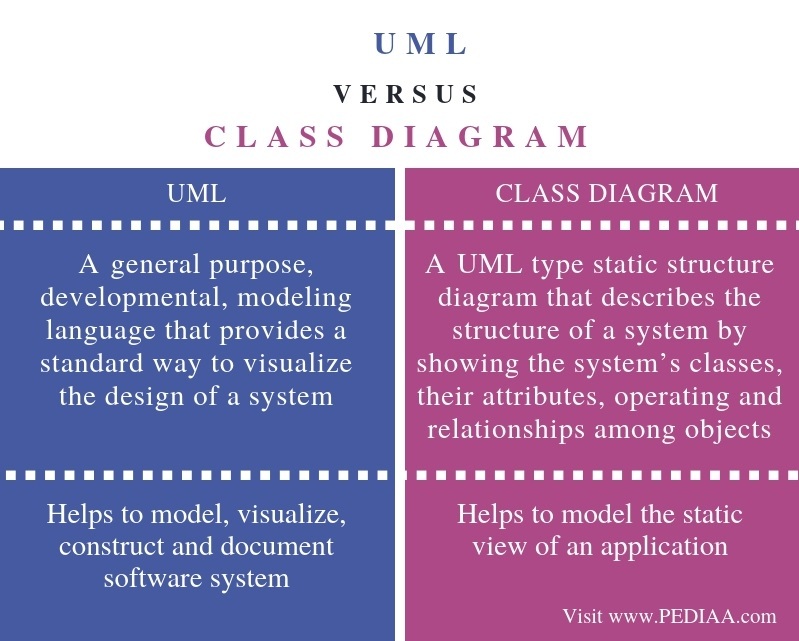 The main difference between UML and class diagram is that the UML is a general-purpose visual modeling language that helps to visualize, construct and document software systems while class diagram is a type of UML diagram that represents the static view of an application. When developing software, it is not possible to develop it at once. It is important to get an understanding of the system before implementing them. UML provides a solution to this issue. It is a visual language that allows modeling the system. There are various UML diagrams. Class diagram, which is a static diagram, is one of them. 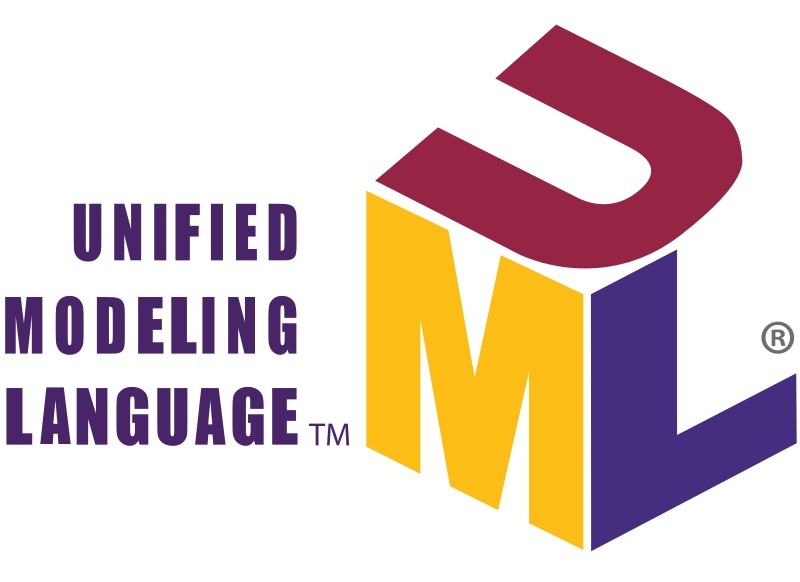 UML stands for Unified Modeling Language. It is a standard language to visualize, construct and document software systems. It is different from usual programming languages such as C++, Java, and Python as it does not use any coding. Moreover, it provides a pictorial representation of software. Even though UML is not a programming language, there are tools to generate code in various programming languages by using UML diagrams. UML is easier and simple to understand and use. It is not made only for developers. Business user and common people can also learn it very easily. Furthermore, UML helps to implement object-oriented concepts. A class diagram is a UML diagram. It is a static diagram that represents the static view of an application. Moreover, it describes the attributes and methods (operations) of a class and the associations among them. These diagrams are widely used in software development as they allow modeling object-oriented programming concepts. Furthermore, a class diagram consists of classes, interfaces, associations, collaborations etc. Class – Blueprint to create objects. Class consists of a name attributes and methods. Attributes are the properties while the methods are the operations. Object – An instance of a class. Interface – Consist of operations and/or attributes that define behaviors of objects. Artifacts – Represent concrete entities such as documents, databases, executable files etc. Furthermore, there are interactions to represent the relationships between the classes. Inheritance – Allows the subclasses to use the attributes and methods of the parent class. Bidirectional association – Represents the default relationship among two classes. Unidirectional association – Association navigates only to one class. A class diagram is a UML diagram. UML is a general purpose, developmental, modeling language that provides a standard way to visualize the design of a system. In contrast, a class diagram is a UML type static structure diagram that describes the structure of a system by showing the system’s classes, their attributes, operating and relationships among objects. 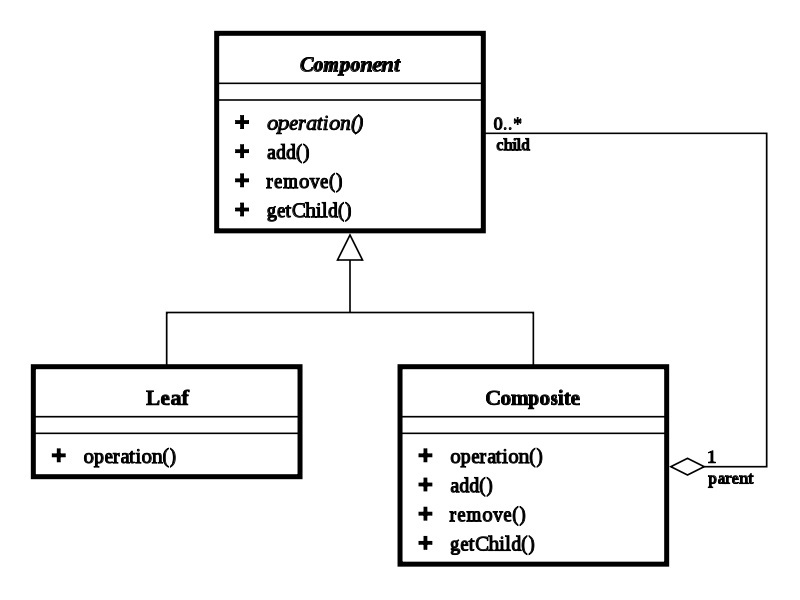 Thus, this is the main difference between UML and class diagram. Another difference between UML and class diagram is that the UML helps to model, visualize, construct and document software system while a class diagram helps to model the static view of an application. The main difference between UML and class diagram is that UML is a general-purpose visual modeling language that helps to visualize, construct and documents software systems while class diagram is a type of UML diagram that represents the static view of an application. 1. “Unified Modeling Language.” Wikipedia, Wikimedia Foundation, 24 Oct. 2018, Available here. 2. “UML Class Diagram Tutorial.” Lucidchart, 1 Nov. 2018, Available here.